If so, then is it true that a percentage of anything other than 100% is "Display Scaling" (what is to be disabled) and a percentage of 100% mean no display scaling? When do I have "High DPI Settings"? My monitor is 2560x1440. Is there somewhere where I choose whether it's set to "High DPI" as opposed to something else (no idea what the opposite of that is)? Is it inherently High DPI? Non-High DPI? I have a Dell UltraSharp U2515H, and, as this is only a 25" screen, perhaps it is always High DPI? What I actually want is to leave Windows scaled at 150%, so the various UI elements are readable, and make Lightroom and Photoshop work at 2560x1440. However, when I check the "Disable Display Scaling on High DPI Settings" checkbox for those applications, their UI is unchanged. Hopefully using the second method will solve your problem as it works much better than the first. I will first address your second question and then the first one. High DPI refers to the setting when the display is set to more than 96 dpi. The exact DPI of your display depends on 3 things. This is what you set through Display Settings in control panel. So, I can set my 14" display to any DPI setting from 96 dpi to 192 dpi. I also have a 21.5" monitor with 1920x1080 resolution. This translates to 102 dpi (effectively 96 dpi). This means I cannot set this monitor to high dpi. Even if I change the percentage through Display Settings it will only result in a zooming effect. When we change the DPI setting of a display, the number of pixels available on the display changes. Suppose we move from 96 dpi to 192 dpi, the number of available pixels on the display will double (note that the pixels are present always, we just use less or more of them depending on the dpi setting). Under 96 dpi setting, a window of 96 pixels width would occupy entire width of the screen. But under 192 dpi setting, the same window would occupy only half the width of the screen. This may result in your fonts (and other things) appear too small to be read. So, windows offers an option of Display Scaling. 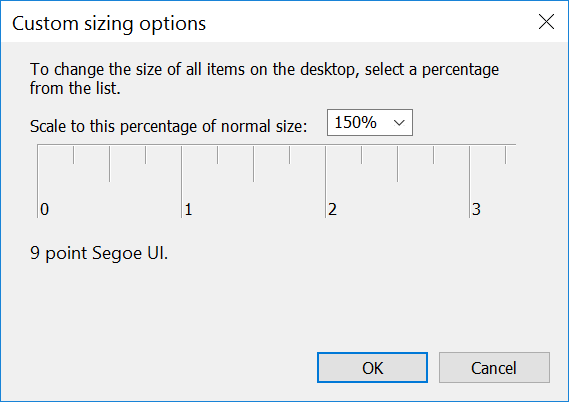 When the DPI of a display changes, windows will automatically scale the window sizes to suit the display. In the above case, after Display Scaling, our window would occupy the entire width of the screen. How can I prevent automatic DPI scaling when HDTV on HDMI port is enabled? High DPI screen & Windows: how to make programs behave as on low-res screens?